Time for Muffin Tin Monday! I found this cute bunny tin at A.C. Moore for $1. Then I used my duck feet muffin cups. Pierce had my stir fry with edamame, tofu, and mushrooms, a fortune cookie, and some fresh mango. I change up the veggies in my stir fry depending on what I have on hand, but the boys always love it. It's one of my favorite post-long run meals. It's really quick to throw together, and well balanced. You can read about how I make it here - you'll have to scroll down a bit. This post is linked up with Muffin Tin Mom. I'm doing a giveaway for a Creativity Journal and Card set HERE if you'd like to check it out. The stir fry looks wonderful! The bunny tin is soo cute! Would love to have fortune cookie! WHat a healthy and fun fun fun meal! The bunny dish is very cute and lunch looks yummy! Looks so yummy, and we love edamame too. Why can't grownup lunches be this fun! Okay this is just way past cuteness! I bet your boys just love meal time! so cute. and what a score on the muffin cup! Love that little bunny and yummy to stir fry! Have you ever tried putting pineapple in their stir fry? My dd loves it! Looks like a delicious lunch. I love your bunny and duck feet tins. What a great lunch idea! I never thought of doing stir fry for lunch but my kids would love it! love those feet muffin cups! 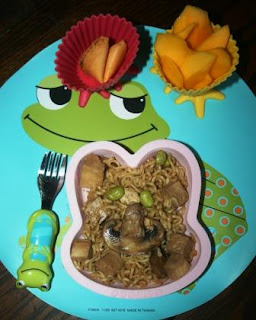 looks good and that froggy fork is so cute! Mmmm stir fry is always good. My girls LOOVE edemame too. It is sooo cute watching them get out of the pods. ha ha ha.